We at PROMETHEUS Bikes believe, cycling is the first step in freedom and independence for children. PROMETHEUS Bikes is originally a young family business from Munich - Germany. As parents, we know what is important for a good bike: quality, functionality, safety, design and high value retention. That's why we produce lightweight and beautiful children's bikes. • detachable support wheels incl. • detailed and illustrated assembly instructions with usage instructions incl. Tools included! ☛ You will find a suitable kickstand and other great accessories in our PROMETHEUS BIKES Shop. If you have any questions about the assembling or the product, please do not hesitate to contact PROMETHEUS Customer Service. ✅ NEW IN THE USA: Already a hundred times positively reviewed in Amazon Europe and now also available in Amazon USA. ✅ LIGHT | STABLE | SAFE: Sensational processing, clean welds - The specially designed by us child's bicycle frame is lightweight and looks sporty, without the little drivers have to do without a low step. ✅ SAFETY FIRST: This premium 12" PROMETHEUS® children's bike complies all standards and requirements of the EU (DIN 14765) as well as the USA (ISO 8098). Absolutely suitable for children! 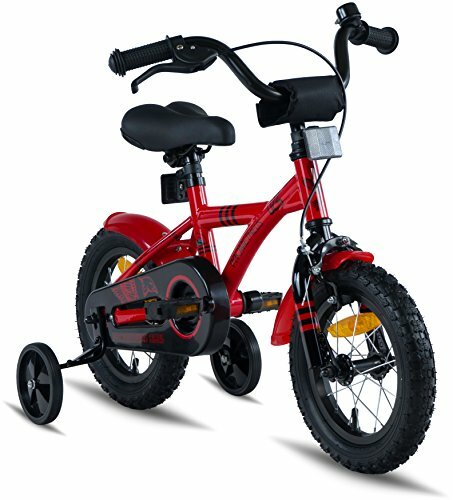 ✅ EXTRA FOR KIDS: Absolutely individually adjustable child's bike with large adjustment range - Equipped with ball bearing handlebar that is adjustable for both height and tilt angle. Extremely high-quality comfortable child saddle that is adjustable to rider height as well as the proper angle to maximize stability and safety. ✅ CHILD-ORIENTED BRAKING SYSTEM: Rear Wheel with Coaster Brake - An absolute necessity for every juvenile bicycle of this size! Alloy Caliper brake on the front wheel. Two from each other independent brakes, as the German legislature prescribes for a safe bike. ✅ ALL IN PROMETHEUS SAFETY PACKAGE: with aluminum bell, safety handlebar pad, non-slip safety grips, reflective non-slip pedals, safety chain case, fender set, detachable stabilizers and extra large reflectors around the juvenile bicycle and aluminum spokes. Further information and details can be found below in the description. If you have any questions about this product by PROMETHEUS BICYCLES®, contact us by completing and submitting the form below. If you are looking for a specif part number, please include it with your message.